European Antennas Ltd has designed three flat panel antennas that have Type Approval from the UK Radiocommunications Agency to ETSI standards, providing system suppliers with cost and time savings over non-approved antennas. For digital radio applications in the 1.35 to 1.52 GHz band, they can be used for applications requiring up to 500KHz bandwidth supporting up to 2Mbit data rates. A wide range of applications include provision of ship-to-shore flow and storage data in the gas, oil and chemical processing industries. Model FPA14-MPT1417/169 has 14dBi gain, meets ETSI Class 1 approval and is just 334mm square. Meeting the requirements of ETSI Class II, model FPA17-MPT1417V/348 has vertical polarisation and model FPA17-MPT1417H/349 has horizontal polarisation. Each measures 340x680mm and has 17dBi gain for transmission of high data rates over increased distances. More environmentally discreet than other types of antennas, a slim profile of 22mm is achieved by using multi-layer printed circuit phased array technology. An offset RF connection point ensures antennas are installed correctly. 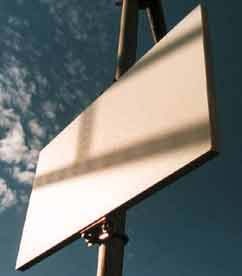 All three flat panel antennas have lower sidelobes than traditional yagi antennas and excellent cross polar performance to ensure resilience to interference from other signals in dense electromagnetic environments. Azimuth Half Power Beamwidths are within ETSI specifications. These antennas could be used where a dish may have been previously specifiedl. For long-lasting, reliable service, the antennas are of rugged construction and fully sealed to protect from all weather conditions. They are packed with dielectric material to ensure internal condensation will not occur.